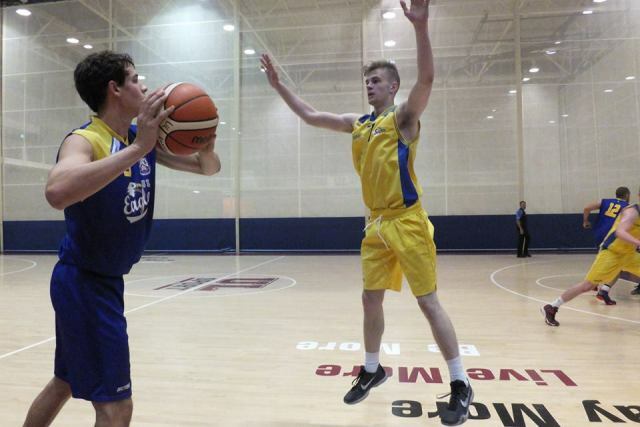 DCU Saints came from 12 points down to win their first game of the season in a valiant second half performance in their Men’s Premier League game at the DCU Sports Complex last Saturday. American Duane Johnson scored 16 second half points in helping the Saints slump UCD Marian to their first away defeat of the season. Johnson’s signing was only officially announced on the Saints’ Facebook page on Friday morning after arriving in Ireland earlier this month. Johnson collected 26 rebounds and scored 18 points in an inspirational display. “When we play like we did today we feel like we can beat anybody. We could be one of the best teams in the country,” Johnson said after the win. As the game commenced it was in fact Johnson who won the tip only for it to be knocked down to Marian’s Michael Chubb. The opening score of the match took over a minute to arrive but it came courtesy of Marian’s shooting guard Alex Zurn who drove at the heart of the Saints defence before popping up with the lay-up. After just a few minutes the Saints brought on Arkadijis Makarenko in replace on Martin Neary, and it was he who spurred life into the game as DCU got on top. Makarenko was fouled in the fifth minute resulting in two converted free-throws but two minutes later when the Saints weren’t given the benefit of the doubt, the decision had Saints boss Boylan on his feet arguing with the referees. UCD broke down the other end and gained the lead for the first time since the opening score through Dustan Moreira to make it 12-13. The Saints took the lead once more and in the dying seconds of the first quarter Makarenko converted successive free-throws before Mark Nagle replied for Marian to bring it back to just two points. The opening exchanges in the second quarter were shared by Makarenko and UCD’s Neil Baynes. DCU’s leading scorer this season Eoin Darling then stepped up with a three-pointer to make the game 30-28 in his team’s favour. Baynes replied for the away side with the game’s first dunk which later proved to be a turning point in the middle quarters as UCD began to pull away. Marian ended the first half with eight unanswered points through Moreira, Baynes and Zurn to put the sides in at 32-40 at the interval. At the start of the third quarter it seemed no matter what the Saints threw at the visitors they would just not budge and through the superb Neil Baynes, UCD opened up a double-figured lead and after just five second half minutes led 54-42. When Saints supporters may have feared the worst, it was Johnson who finally got into the swing of things and had some crowd members off their feet with his fourth rejection of the game. Suddenly the Glasnevin side were oozing with confidence and despite a rocky start to the penultimate quarter, they remained within arm’s length of their opponents at 50-58. Martin Neary ignited the final surge for the Saints when he landed his three-pointer moments into the quarter while James Harding’s contribution brought his side back to just a four-point deficit. Marian’s Dan James and the Saints’ Harding traded lay-ups before Johnson brought the game back to within two points with under five minutes remaining. DCU called a time-out however, immediately after Nagle landed a massive long range effort for the Southside club. The Saints pushed on and even though he was fouled in the proceedings, Johnson leveled the game at 69 a piece. Baynes and Makarenko converted single free-throws respectively for their sides to set up a tense finish. Astonishingly, with only 14 seconds remaining, the excellent Makarenko finally put the Saints ahead after landing a jumper while being fouled. He followed it up with the and-one. Marian’s buzzer beater failed to the delight of Boylan and his team who have finally opened their account this season. UCD Marian: Conor Ross, Conor Meaney(11), Michael Chubb, Mark Nagle(13), Alex Zurn(6), Dan James(9), Barry Drumm, Ciaran Dunne, Neil Baynes(17), Laimonas Jonaitis, Dustan Moreira(14), James Brophy.